It was a big day when we all met to try and get it in the boat! Heres the crane guy; Tom Robinson setting up. 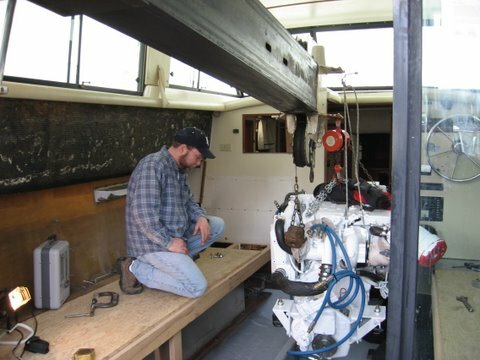 He was the same guy who took the old engine out in the fall. Can't say enough about the job he did, if you ever need a crane, he's the man. Theres his contact info on the door. First thing we had to do was get the engine free of the crate, and install the forward engine mount brackets. Next up was just trying to get it in the boat. The plan was to hold it over the back, and then sort of swing it in and onto the cockpit floor where we would then reattach it to the boom. We used a peice of rope to try and get near the 6 degree angle of the shaft. Tip! ; Have an engine lift made up, that will keep the height low, and you should be able to adjust the angle by making one side a bit longer. This is one of the forward ones. Because the stringers in these boats get shorter as you go aft we were able to have the forward ones going this way, but the aft ones we could not. Heres the rub, the way Cummins made the motor brackets that come off the gear and the way we made the angle irons just made for a bad combination. Theres really not going to be an easy way to get at the rear motor mount adjustments. The other thing of note, and this may not apply to others depending on the gear, but the gear I have, the ZF220, the left side bracket is shorter than the right. This caused us a few problems, we had to run to my friends machine shop during the installation for a little angle iron adjustment.